📅 📅 January 2019 April 4, 2019 by Bruno B.
Ponta Delgada, Azores. The place where I was born and where I still spend a big portion of my year. 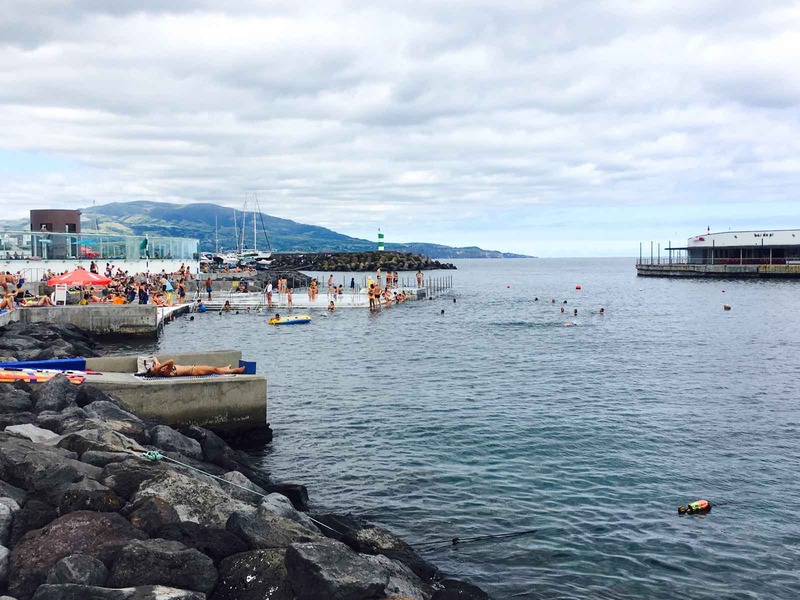 These are the top things to do in Ponta Delgada, all local tips from a proud Azorean. The Azores are now a trending destination in Europe, a lot has been said about the islands and São Miguel in particular. Yet for some reason my hometown Ponta Delgada is still overlooked. And it’s almost a mandatory stop in any Azores itinerary! Ponta Delgada is the unofficial capital and most busy town in the Azores region. For most, it will be the welcome gateway in the archipelago. Don’t expect long avenues of expensive shops, a pungent nightlife or the overall buzz of a metropolis. It’s still the tranquil Azores after all and Ponta Delgada is still a quiet town for most standards. Do expect century-old churches, quaint cobbled streets and squares, a looong seaside promenade, and a delicious collection of local bars and restaurants, all featured in these 12 things to do. 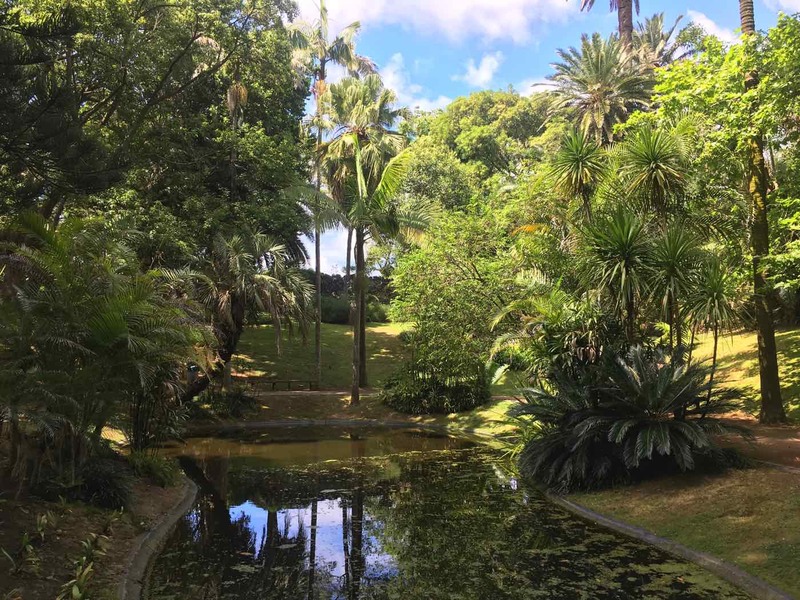 With no further ado, these are the best things to do in Ponta Delgada, Azores. 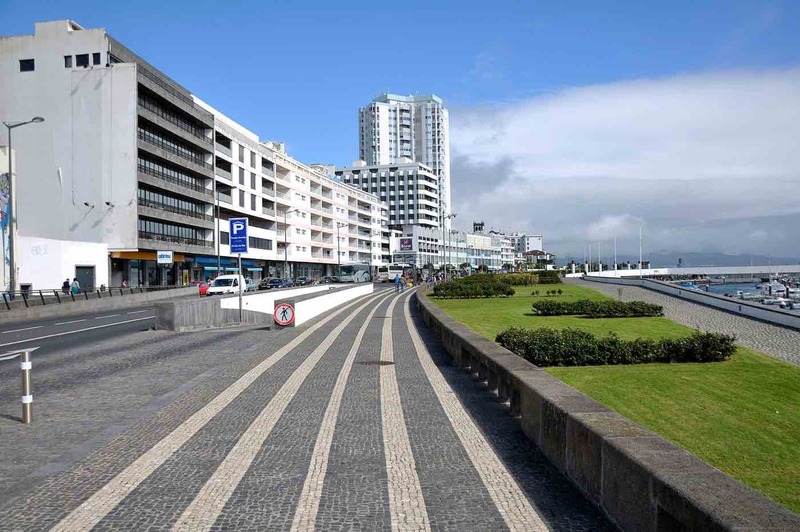 In Ponta Delgada, all roads lead to Avenida. Locally known as simply Avenida, this seaside promenade is popular with both locals and tourists. It spawns from the Forte de São Brás military fortress on the west to Portas do Mar and Calheta on the east, a path marked by twisted black-and-white cobblestone patterns. Along the way you can find shops, bars, cafés, Sol Mar shopping center, a marina, and the iconic Ponta Delgada’s City Gates. You can combine it with Portas do Mar on the same stroll. 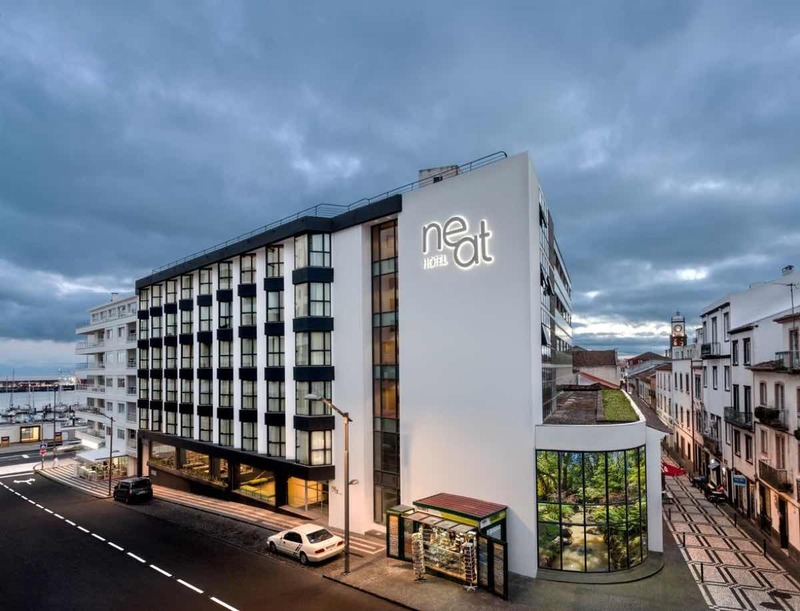 Start searching your place to stay with this pre-filtered list of the best hotels in Ponta Delgada. This sanctuary/convent was built in 1541 and is still occupied by nuns of the order of Saint Francis. It’s the most important religious building in Azores, containing an immense treasure of religious art. 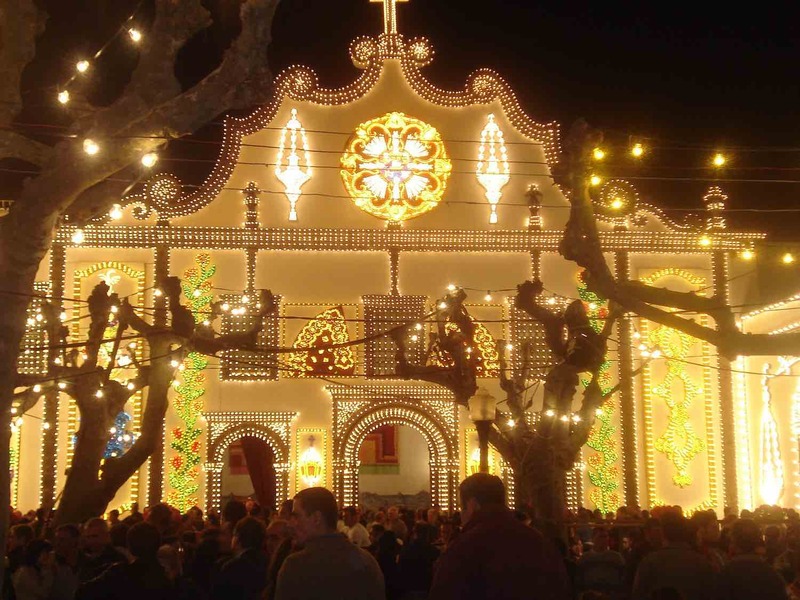 It’s the hotspot for the Santo Cristo dos Milagres (Saint Christ of Miracles) celebration, who brings thousands of people to São Miguel. The chapel inside holds the main Ecce Homo image, profoundly worshipped by religious locals, with its intricate outfits and jewels. If you are around during the celebrations – around April/May – don’t miss the flower carpets decorating streets of the city center as well as spectacular façade illuminations at night. Expect live music, street markets, and other cultural events happening in the nearby Campo de São Francisco and all across town. 2019 dates are 24-30th May. Carvão Cave (translated as Coal Cave) is the largest lava tunnel tube in São Miguel. Along the almost 2km of cavern walls, find bridges, stalactites, stalagmites, columns, and many other volcanic structures that show how the lava moved inside. Obviously not for the claustrophobic folks! The icon of Ponta Delgada. Literally the symbol of the city – they’re in the city hall’s logo – this monument represents how Ponta Delgada is metaphorically speaking the entrance gates of Azores. Built in the 18th century, these gates mark the spot of the old city harbor and were the first line of defense of the island. Baby pineapples are kind of cute. Ok, I LOVE pineapples. If I could, I would marry a giant Azorean sweet pineapple and be happily ever after. Failing this, the next best thing I can think of is to visit a pineapple plantation when you’re in São Miguel. 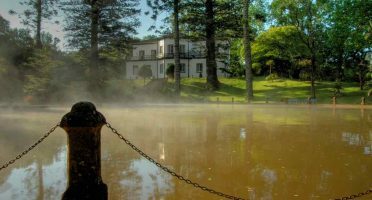 Out of the ones open to the public, the most popular is Arruda Plantation. By entering this series of greenhouses in Fajã de Baixo you can have an exclusive peek of the extremely time-consuming and thorough plantation method used to create these beauties. 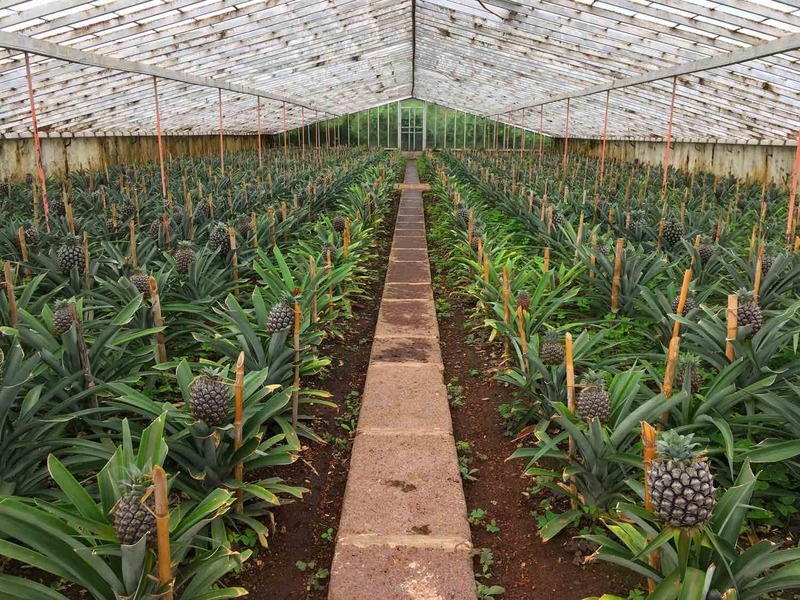 Did you know you need 2 YEARS to fully grow an Azorean pineapple? The plantation grounds also have a small café serving everything-pineapple (from the fruit itself to pineapple cakes and pineapple ice cream). It’s also decorated with the surreal private pineapple collection of the Arruda family who still owns the place. Jars, cups, plates, and many other decorative stuff all in pineapple shapes. Pineapples usually grow in tropical climates typical from Equator (think Costa Rica!). While the weather in Azores is entirely different, seeds from America were introduced in São Miguel island in the 19th century to take advantage of the fertile and nutritious soil. The best way they found to cultivate pineapples were in greenhouses which become very popular in the Ponta Delgada area. The Azorean pineapple is smaller in size, but with a sweeter and more intense taste. Try one and feel your taste buds having a sugar rush! The highest hilltop in town is crowned by (yet another) black-and-white church made of basalt stone: Igreja Mãe de Deus – Mãe de Deus Church. It sits alongside bastions and other remains from the time this was a strategic defense point of the town. Not going to lie: the surroundings are not super interesting and there isn’t a lot to do, but the 360-degree view up there is cool. Come during sunset for the best photos. This place is filled with memories, because my family has done – and still does – most of the grocery shopping here. 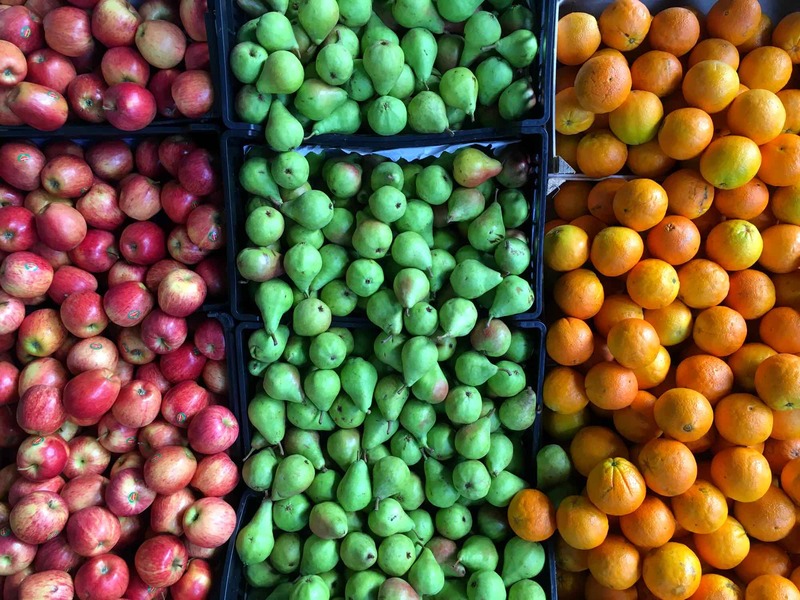 Since I can remember, every Saturday morning going to the market was a thing. As a kid, my favorite part was seeing the live animals – ducks, chickens, rabbits – that were up for sell. Nowadays, although a new layer of stalls and shops catering for tourists has arisen recently but it is still a quite local market. Great spot to find local delicacies and ingredients like cheese, pineapples, tea, and a big array of locally grown fruits and vegetables. It’s more lively on Fridays and Saturdays and closed on Sundays, so time your plan accordingly. An oasis in the middle of the town, this garden is perfect for a morning stroll or run. Venture out, and explore lakes, caves, trails, and the prehistorical collection of plants. In fact, this garden was originally created by a botanist who dedicated his life to import exotic species to its massive private property. The city hall later designated it as a public park in the 50s. While not as spectacular as the Terra Nostra Gardens in Furnas, this has always been one of my favorite places to go when I’m in town and need to relax. time your trip right to see several different species of cetaceans, between April and June. A ticket is worth every single penny. The last time, I chose to go with Picos de Aventura and it surpassed my expectations. A great friendly staff, prioritizing safety but also allowing space for some fun and have a great time out there in the sea. Most companies depart from Portas do Mar area at 2-3 different time slots of the day. Some others also have tours from Vila Franca do Campo.  Care about the whale-being! Whatever tour company you decide to go with, make sure it complies with all the safety and ethical regulations to avoid disturbing and stressing out the animals. Apart from whale-watching, some companies offer dolphin interaction tours which are NOT recommended. There has been increasing proof these tours have a negative impact on the stress of the animals. For some reason, the most experienced whale-watching company in the Azores – Espaço Talassa – stopped doing it. Featuring intricate Portuguese Manueline-style architecture and the typically Azorean black basalt stone, Igreja Matriz de São Sebastião is Ponta Delgada’s Parish Church. It’s better known as Igreja Matriz. Located in the heart of the city, in between the historical center and the sea, it’s one of the most beautiful churches in Azores, if you ask me. My favorite thing about it is the starred cobblestone street that goes around the building. Tip: visit right before sunset when the façade is illuminated by a warm glowing sunlight. 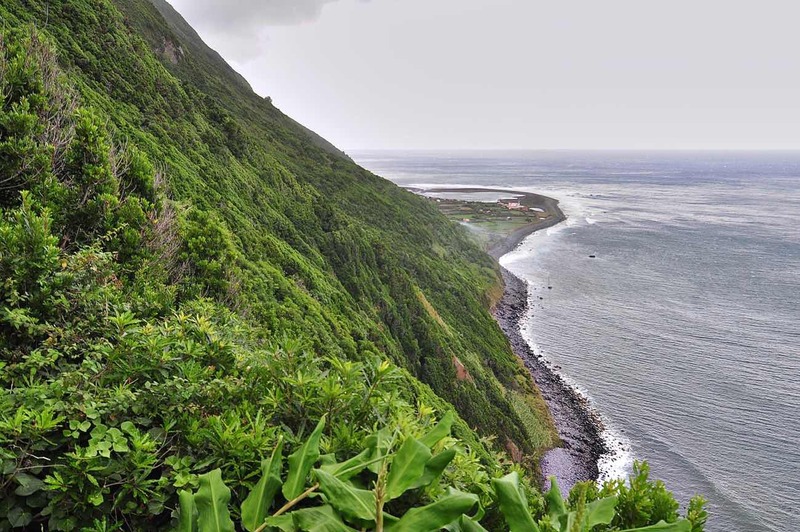 If you want to truly unwind in the outskirts of the city, head to Pinhal da Paz in Fajã de Cima. This park is where locals come to relax, walk the dog or do a family barbecue. This is (for now) a super off the beaten track spot so you probably won’t find many tourists here. You will find however some cool flora – like a bamboo forest! – and some cute fauna, including some deers! Free entry. Go for a swim without leaving the city. 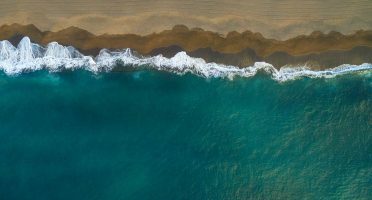 One of the latest big developments in Ponta Delgada was the controversial Portas do Mar (literally Sea Gates) project that changed the seaside area. And all of a sudden, a gian open-air amphiteater, a cruise terminal, a strip of bars and shops, a marina, and a renewed natural pool – Piscina do Pesqueiro were born. Like it or not, good opportunity to cool yourself down with an ocean swim. 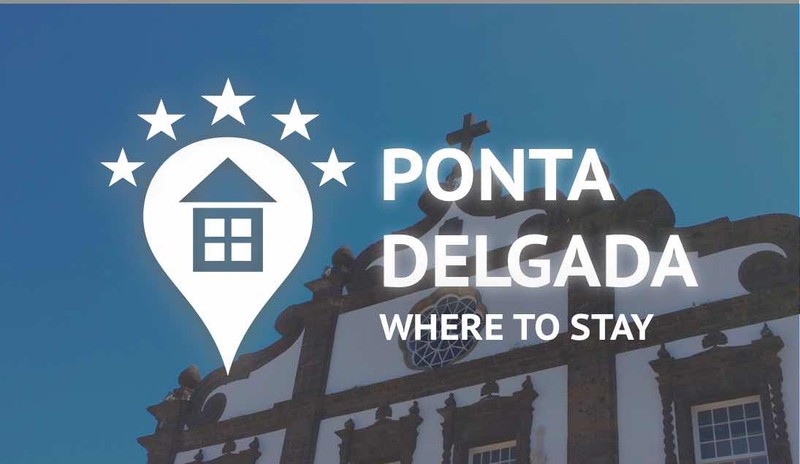 Ponta Delgada is the most convenient place to pick as a hub to explore São Miguel. Not only is geographically in the center of the island, with the best road connections to go everywhere else by car, but also has the best collection of restaurants, shops and supermarkets to enhance your trip. There is accommodation for all budgets in Ponta Delgada. 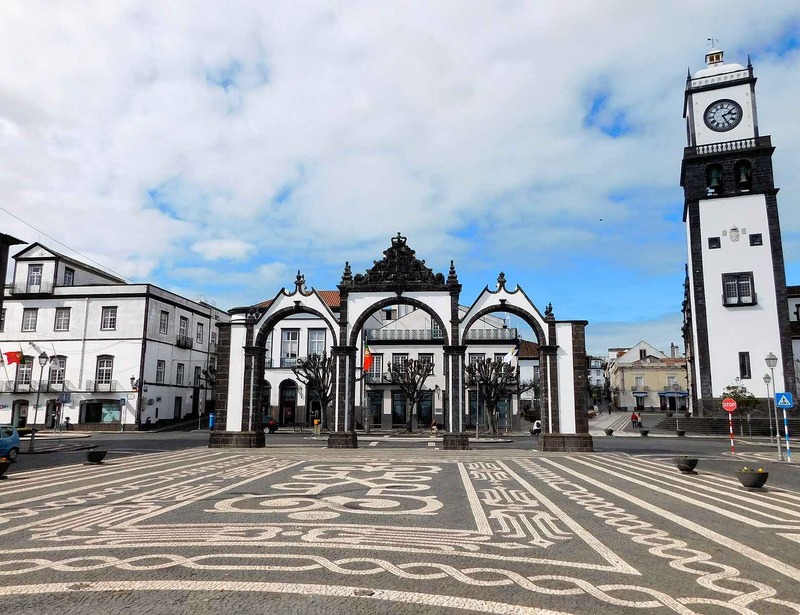 You can start your search with this shortlist of top-rated places in Ponta Delgada with WiFi. Or to make your life easier, just pick your favorite amongst the top hotels I recommend according to each budget. 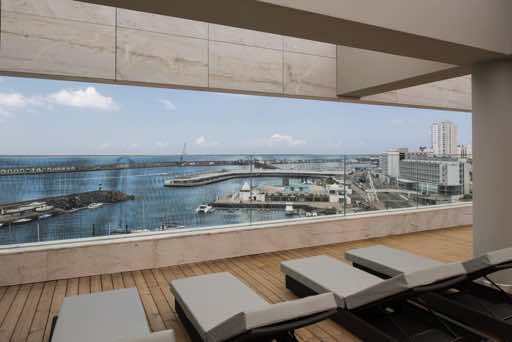 Premium hotel with modern design (opened in 2016) and within walking distance to the city center and to the ocean. 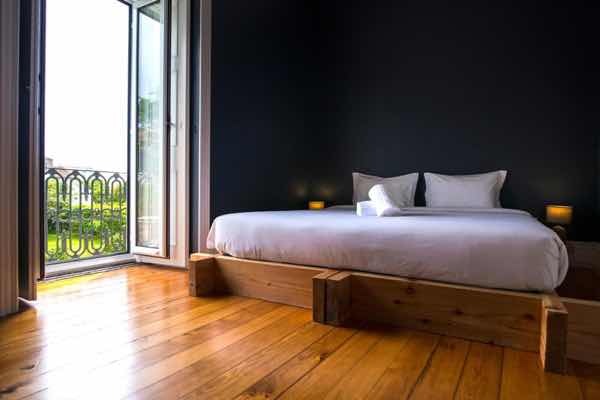 Style levels are high and the location is unbeatable, just a few steps from Ponta Delgada’s seaside avenue. If your budget is limited and you just want a clean and convenient place to stay, this is it. Where to shop in Ponta Delgada? 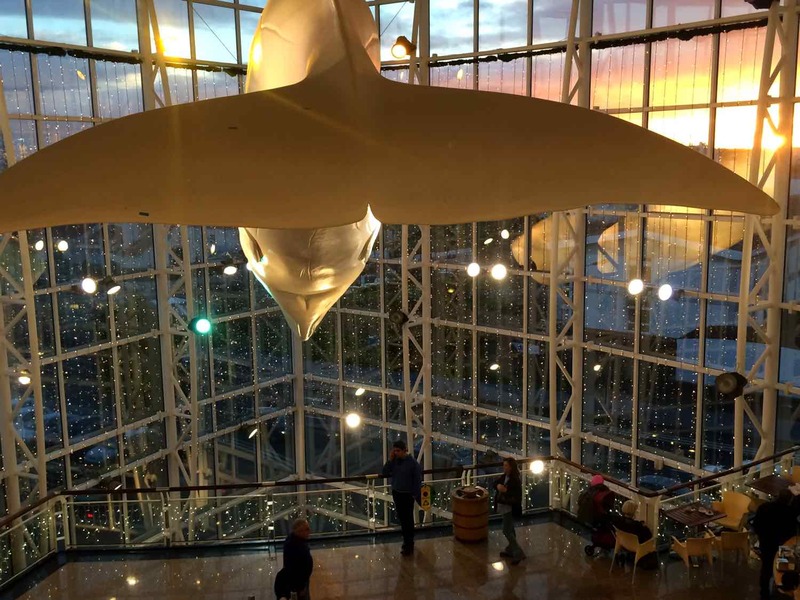 Yes, that’s a life-sized whale! While Ponta Delgada is not a shopping destination per se, you might want to do your fair purchase of gifts, souvenirs, or local delicacies. Parque Atlântico: the largest mall in Azores has a bit of everything. Sol Mar Avenida: a (smaller) shopping center in Avenida. For souvenirs and Azorean gifts, head to Maviripa. Mercado da Graça: the farmers’ market I have done grocery shopping all my life is a fantastic place to peek into local’s food and culture. Downtown: the shops in downtown Ponta Delgada are diverse and many are getting a much needed face lift. Rua dos Mercadores and Rua de São João are the best shopping streets. There are also a couple of shops at the airport selling local ingredients, souvenirs, and arts & crafts. Where to eat in Ponta Delgada? Contrarily to Furnas with its iconic stew and bolos levedos, there is no typical food of Ponta Delgada. Instead, you can find a wide range of restaurants serving local food as well as a growing selection of international and vegetarian restaurants. A Tasca: delicious local food, with a separate catch-of-the-day menu for fish. Good luck getting a table though. Boca de Cena: an experience. This restaurant is a one-man show where the same person cooks, serves and manages reservations. Delicious. O Museu: uncomplicated and unpretentious restaurant serving local food. Those are the best, right? Otaka: if for some reason you get tired of Azorean meat and are craving sushi, this is the only (good) place to go. On the pricey side. Taberna Açor: local tapas. Great cheese and wine assortments. Xitaka: this one I haven’t tried, but heard compelling tales. Seafood place, big in quality and quantity. Quite far off the city center, but check with your hotel for a free transfer (!). Rotas da Ilha Verde: sometimes I go there for the delicious lunch menu. Treze: small fresh and healthy vegetarian place in Ponta Delgada. Try the vegan burger! What has been the highlights of Ponta Delgada, Azores for you?